Home TV and Electronics Installation. Founded in 2001, DYNAMIC AUDIO VIDEO is a full service custom audio video company servicing southern Louisiana and providing unparalleled customer service. As one of New Orleans’ best and most innovative audio video companies, we work with customers of all budget sizes to design and integrate custom audio video systems that optimize performance and value. 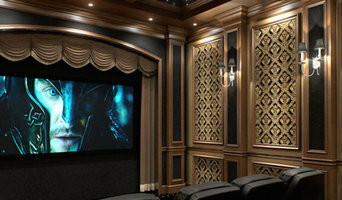 Richie Savoie's New Orleans Audio Video has been a locally owned and operated Home Theater store in the New Orleans area for almost 40 years. They are an authorized dealer of high-end audio and video products from well-engineered brands such as: Sony, Bose, Samsung, Sharp, LG, Onkyo, Yamaha, Pioneer, Denon, Marantz, Klipsch, Kef, Energy, Definitive Technology, and Control4. Our products include home theater, flat screen, automation, lighting, HVAC, security cameras, BluRay DVD players, receivers, amplifiers and speakers. Big Box Chains have come and gone, while we have been in business over thirty years. Our showroom is at 5600 Citrus Blvd. Harahan, Louisiana 70123. As always, we welcome feedback, questions or comments. Feel free to email your inquiries to sales@noav.com and we look forward to hearing from you. Overall home electronic installation firm.